October is National Eczema Awareness Month. If you are reading this article chances are you, or someone you know, is recently affected by it. 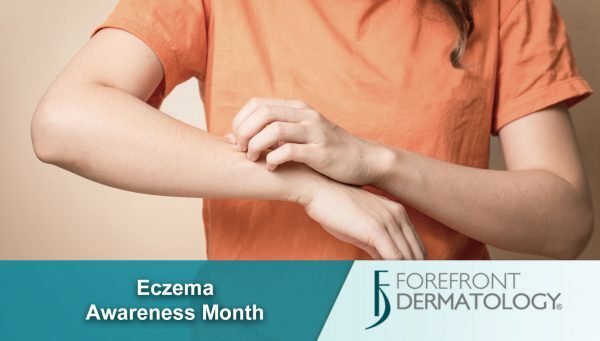 According to Dr. Michelle Cihla, board-certified dermatologist with Forefront Dermatology, “eczema is a skin condition that causes the skin to become red, itchy and inflamed. It commonly appears as dry or scaly patches and can develop anywhere on your body. It isn’t contagious, but develops because of a combination of environmental triggers and genetics.” Eczema is a very common condition with over 30 million Americans having some type. Hand eczema – caused by a combination of genes, irritants and/or allergens. Lichen simplex chronicus – results in thick, scaly patches on the skin, often caused by too much scratching and rubbing. Nummular eczema/discoid eczema/nummular dermatitis – usually caused by allergens or very dry skin and appear as round lesions that can weep fluid, especially in older populations. Seborrheic dermatitis – white or yellow flaky, greasy patches in places with more oil-producing glands, caused by a combination of genetics, hormones and microorganisms on the skin. In infants this is commonly referred to as “cradle cap”. Stasis dermatitis – happens when poor circulation to the legs causes the veins to swell and leak fluid, causing swelling and skin redness and itch. If you are struggling with eczema or other skin issues and don’t know where to turn, the experts at Forefront Dermatology are ready to help. To find the Forefront dermatologist nearest you, visit the locations page today.